MTN subscribers now have another reason to smile as MTN introduces MTN WOW Weekend data to offer free 1GB data for use every weekend. No special code or fee, it is absolutely FREE. 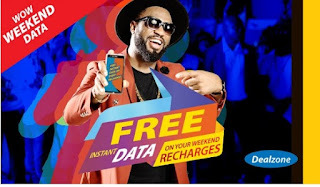 However, to get this free data you need to recharge your MTN line with any amount above 500 Naira (e.g 550 Naira) within Friday to Sunday. If you can't load up to that amount, don't worry MTN will still give you FREE 100MB for recharging between 200 and 500 Naira. I know most people will have some questions, that's why i have compiled a summary of key features of the offer below. The Wow Weekend data is available to every prepaid customer on the MTN network. Recharges with share n sell does not qualify you for the free data, use VTU OR physical recharge cards.